Ten years ago, following a devastating loss, Lily Danville fled Cedar Ridge in a swirl of grief and guilt. She's built a good life for herself in San Diego but when she becomes embroiled in a scandal of her boss/boyfriend's making and is both dumped and fired, she goes to ground in the remote Colorado mountain town of her youth and comes face to face with all she left behind. She's only there until the dust settles and she can find another job in California but the longer she's in Cedar Ridge, the more she remembers how much she loved living there before the tragedy. And the more she's in the company of Aidan Kincaid, the more she remembers the feelings she had for him before she left the first time. Can she finally put the past to rest and give herself permission to reach for the happiness she doesn't think she deserves? 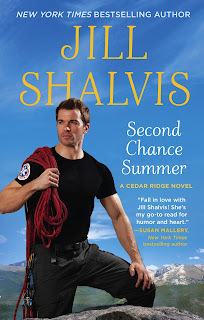 Aidan Kincaid loves his hometown, his family, his job as a firefighter, his search and rescue work and the beautiful but treacherous mountains surrounding his town. Once upon a time, he thought he could love Lily Danville too but she left without a word and hasn't been back since...until now. Serial dating has been his modus operandi for the past ten years but Lily's return has him yearning for something more. Will he find it with Lily this time or will she drive out of his life and leave him brokenhearted a second time? Aidan's life isn't all sunshine and roses. He and his siblings have worked hard to save their family ski lodge after their philandering father took off and left it on the brink of bankruptcy. There's a balloon payment coming due and if they can't make it they'll lose the business they love, the business that's holding them together. There are other issues facing the siblings as well that I'm sure will be explored in more depth in each of their books. Facing her feelings for Aidan isn't the only obstacle standing in Lily's path to happiness. She used to love the mountains surrounding Cedar Ridge as much as anybody and was a skilled climber but the events of one tragic day left her with a debilitating fear, along with a whole lot of guilt. Shalvis guides her slowly and realistically down her path to acceptance and forgiveness, finally freeing her to accept not only her feelings for Aidan and his for her but also her love and acceptance of the mountain peaks that were once such a huge part of her life. I enjoy most of Jill Shalvis' books but Second Chance Summer is a stand-out for me. It has everything I look for in a great contemporary. The dialog between Lily and Aidan and among the Kincaid siblings is spot-on, secondary characters add a wonderful richness and the brothers' reactions to their mom wanting to date again are priceless. The depth of emotion is rich and real, bringing forth laughter in some parts, tears in others and an ending that was all I could have hoped for. I like these characters and am already fully invested in their happiness. The Kincaids are not your typical family. While Aidan and his older brother Gray are full brothers, the three younger siblings are the results of his father's extra-marital affairs but were all taken in by Aidan's mother at some point in their lives. It makes for a fascinating dynamic that has me anticipating the rest of the books in this series even more. I highly recommend adding Second Chance Summer to your reading list this summer. Have you read Second Chance Summer yet? Did you fall in love with Lily and Aidan as much as I did? Have you ever faced your greatest fear? Were you able to overcome it? Don't enter my name in the giveaway because I already have this book. In fact, I just finished reading it. It is definitely another winner for Jill. This is going to be a great series. I loved it, Cheryl. Can't wait for more visits to Cedar Ridge! I won't be complaining either! You have lots of great reading ahead, jcp! I don't read a lot of contemporary but she is on the top of my list - love her books! I have read just about all of Jill's books.. She just makes my day more brighter when I read one of her books. I love, love her books!! Her Animal Attraction series is awesome. I can't wait to read this one. Thanks for the chance. I love Jill's books and can't wait to read this one. Her Lucky Harbor series is special. Thanks for the post and giveaway. I do enjoy Jill's books (and her Facebook & blog posts and the pictures of her life & animals). I've enjoyed her Animal Magnetism series, but haven't started this new series yet. I just finished my Kindle copy of Second Chance Summer and loved it!! I do love Jill's books! I have only sad one Jill Shalvis book. I really enjoyed it. It was in the middle of a series, so I need to go back and read the previous ones first, then finish the series. I did face one of my big fears, spiders, but I didn't have much of a choice. I was in the Peace Corps in the tropics and the spiders were huge. They were just too big to squash, so I called a truce. Thank heavens for mosquito netting. I woke up one morning with a tarantula sized spider on the wall right in front of my face. I only killed one in 3 years. It was in the middle of the doorway and wouldn't let me out of my room. When I poked it with my umbrella tip, it reared up and flashed its fangs. He broke the truce. They still aren't my favorite creature, but I don't freak out over them anymore. I absolutely love Jill Shalvis' books! I've read all her Animal Magnetism books except Still The One and all her Lucky Harbor books except for the last three. Her books are always so full of fun and I always fall for her hot heroes! It's hard to pick a favorite because I love each book more than the one before! LOL. If I had to pick a favorite, it would be Rumor Has It for the Animal Magnetism since I love Griff and Kate and Always On My Mind for the Lucky Harbor series. Thanks for sharing the excerpt, this one is already on my wish list. Jill is one of my favorite can't miss authors. Besides Second Chance Summer, the only one I haven't read is Still The One. I'm all caught up on the entire Lucky Harbor series (which I'm totally bummed out that it's over!) and also the Animal Magnetism series up until Still The One. I do really enjoy the humor and emotions in Jill's books! I have read several of Jill's books; she is so funny. Hard to pick a favorite. I liked Without a Clue (or something like that). LOL. I've been reading her books for a long time. Favorites: HEAD OVER HEELS, AT LAST, MESSING WITH MAC, SEEING RED and DOUBLE PLAY. No favorites. Cannot choose. LOL. Have not faced by fear of snakes. Have not read Second Chance Summer.